Miniature Herefords first came to our attention here in New Zealand in 1997. Embryos were imported from Canada and live animals from Australia to establish the first breeding stock in New Zealand. Miniature Herefords originated in Texas and were bred by the Largent family, who has been breeding top show Hereford cattle since the early 1930s. Since then the interest in these smaller chunky Herefords has grown and the appeal of easy handling and less pasture damage has given smaller acreage farmers who love Herefords the chance to have the breed they prefer to suit the size of their farm. With 135,000 lifestyle farms here in New Zealand and growing fast the Hereford breed can now fit all size farms and breeders. 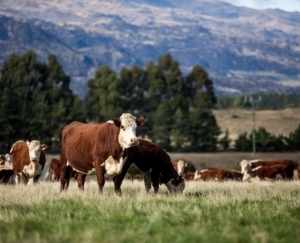 Miniature Herefords are pure Hereford and have to pass the strict criteria of the NZ Hereford Association and also until forming their own Rules and Regulations have been registered with the Australian Miniature Hereford Cattle Association. In May 2004 a group of Miniature Hereford breeders met in Rotorua and formed a new group called the NZ Miniature Hereford Breeders Group. 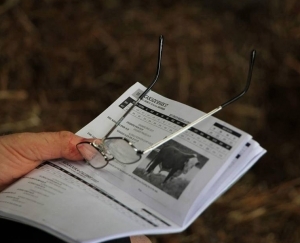 The NZ Miniature Hereford Breeders group will run in conjunction with the NZ Hereford Assn and has rules and regulations that maintain strict criteria on eligibility to register as a Miniature Hereford. The NZ Hereford Assn and the NZ Miniature Hereford Breeders Group both work together to maintain the quality and purity of the breed. Miniature Hereford breeders have the same aims and goals for their breeding programs as regular size Hereford breeders and look forward to promoting the Hereford Breed with pride. 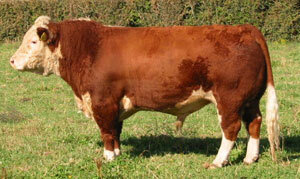 The Miniature Hereford Breeders Group currently has registered 29 breeders and a number of commercial breeders.